17 facts that prove the epic will never fade. On December 17, 2003, Lord of the Rings: Return of the King released in U.S. theaters. It was at once critically acclaimed and commercially colossal, generating not only one of the largest box office returns in the history of movies, but also garnering near-unparalleled critical success. For a blockbuster action epic to be beloved on a universal level is still unheard of, even in the age of superheroes, so for the 15th anniversary of the movie, here’s a recap some of the most astonishing achievements of Return of the King. Now presenting: 17 Amazing Facts about Return of the King. Return of the King was the highest-grossing movie of 2003. It made $377 million stateside and over $1.1 billion worldwide. That $1.1 billion mark made ROTK only the second movie to ever eclipse the billion-dollar mark. Titanic was the first. This also means when it finished its theatrical run, ROTK was the second-highest grossing movie of all time. Return of the King places 21st among the highest-grossing movies of all time. That’s one spot lower than—*sigh*—Transformers: Dark of the Moon. Return of the King was nominated for 11 Academy Awards, and it won all of them. This is the highest sweep in Oscars history. The movie won the Best Picture and Best Director Oscars. It is the second sequel to do so. The first was Godfather: Part II. Although the movie’s cast didn’t receive any love from the Academy, they did receive some other awards nominations throughout the course of the Rings trilogy. The most-nominated actor was Ian McKellan (Gandalf), who received 12 nominations across the three movies. Second-most is Andy Serkis (Gollum) with 10, and third-most is Sean Astin (Sam) with nine. Return of the King’s soundtrack peaked at #36 on the Billboard Top 200 albums. In total, ROTK’s soundtrack totals about four and a half hours of music. The movie won an Oscar for Sound Mixing, though its editing was strong, too. The fall of Sauron’s tower is made with human screams and the screech of a donkey, and the spider Shelob’s scream comes from a Tasmanian devil. The Oscar for Best Visual Effects was a lock for ROTK. 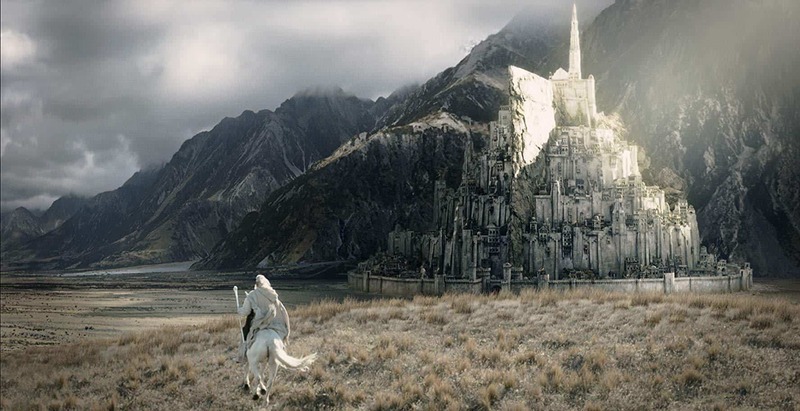 The movie features over 1,400 visual-effects shots, more than double the amount in Two Towers. There are over 200,000 digitally-rendered characters in the Battle of the Pelennor Fields sequence. Despite an Oscar for Best Film Editing, ROTK inherited a few tricky scenes left over from Two Towers, including the death of Saruman (Christopher Lee). After some pick-up shoots and audio dubbing, the planned scene was ultimately cut from the theatrical release of ROTK, to much controversy. There was a fan petition to restore the scene (it was included in the movie’s Extended Edition), and the relationship between Christopher Lee and director Peter Jackson went sour. Peter Jackson never saw the completed movie until its premiere in Wellington on December 1, 2003. During test screenings, audience members were confused over the design of the Witch King, thinking Sauron had joined the battle. The design team had to change the villain’s entire look, and all the character’s scenes were re-shot. That one single shot of Sam lifting Frodo onto his back? (“I’ll carry you!”) It took two hours to shoot. The last scene the hobbit actors filmed was of Minas Tirith bowing to them toward the movie’s conclusion. Their first scene of the trilogy was them hiding from a Ringwraith beneath a tree on the road out of the Shire.